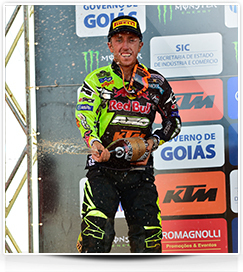 The long run to the MXGP title in the FIM Motocross World Championship this year for Antonio Cairoli was completed with third position overall at the Grand Prix of Goias and the Sicilian had cause to celebrate - as he did four years ago in Brazil - by claiming his sixth consecutive championship in the premier class of the FIM series. 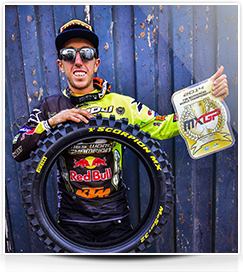 Cairoli now has eight crowns in just twelve seasons of GP racing and helped notch a 61st FIM accolade for the Pirelli SCORPION MX32™ tyre. In Brazil the third step of the podium was enough to seal the deal through a campaign that has included 9 wins and 13 podiums from 16 events. 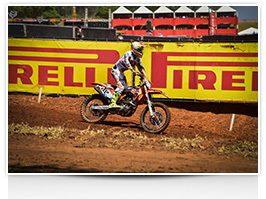 Across the dark red clay that also carried a softer top layer of soil, Cairoli elected to use Pirelli SCORPION™ MX MidSoft 32F front and rear on the works KTM – a selection chosen by the rest of the Pirelli elite – and defended a cushion in the MXGP standings of 81 points coming to Trindade over nearest rival Jeremy Van Horebeek. The Yamaha rider crashed on Saturday and injured his right ankle, which made the job easier for the reigning number one. The Belgian rode conservatively to 13th position in the first moto, which was just enough to secure the points necessary to confirm his status as number two in 2014. He decided to sit out the second moto and will have the injury evaluated before making a decision for the final round in Mexico. In the Brazilian classification Tommy Searle was fifth overall and followed by Kevin Strijbos in sixth, who managed to make sure of third place in the championship partly thanks to the continuing absence of Suzuki team-mate Clement Desalle due to a wrist injury. Pirelli SCORPION MX32™ was present on the podium in MX2 class with Frenchman Dylan Ferrandis who decided to run dimensions of 120/80-19 and scored second ahead of another Pirelli representative, Tim Gajser; the Slovenian won the second moto and saw the chequered flag for the first time in his career with the help of a 110/85-19 size. 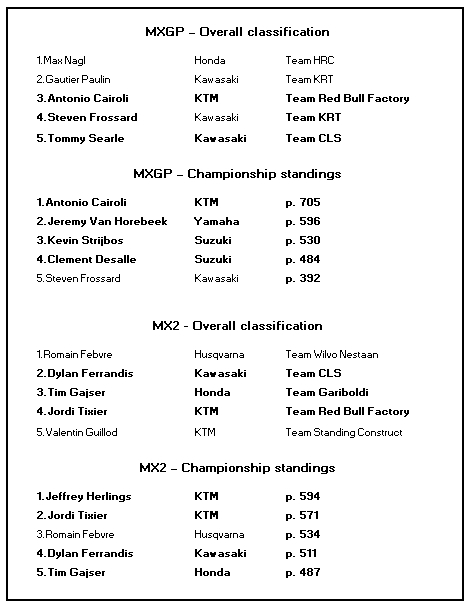 KTM’s Jordi Tixier was fourth. Tixier must bag at least 24 points in the final Grand Prix of the season in Mexico if defending champion and MX2 points leader Jeffrey Herlings does not recover from his broken femur in time to fly to South America.